'I'd have that again' ... a direct quote from the meat-loving hubs! If our meat-eaters are requesting this you know it has to be filling and delicious! Here is a super healthy and delicious vegetarian lunch that we all enjoy! It's super simple as well, simply grill up slices of eggplant, and place on a wrap lined with 1 tsp of our roasted red pepper & cilantro hummus! (See previous post for recipe) If it's a busy week and you don't have time to make your own, feel free to take a little help from the store and buy hummus at your local grocer! We top the grilled eggplant and hummus with a tomato, garlic and basil salsa! If you want a little spice, adding a little jalapeno to your salsa would give it the perfect kick! 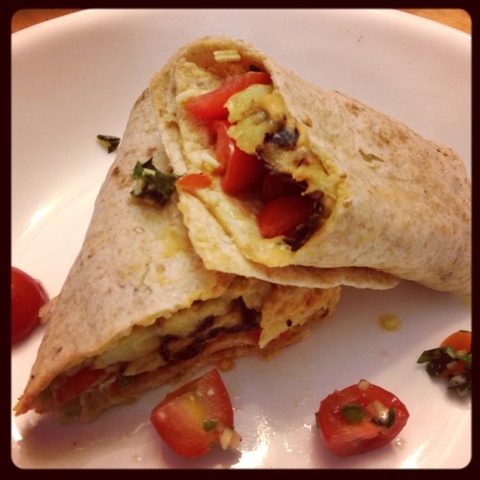 Simply roll up in a whole wheat tortilla and you have yourself a healthy and fulfilling lunch! Skip the chips and serve alongside mixed baby greens or grab a handful of veggies to snack on and enjoy this tasty lunch! Take tortilla and microwave for 20 seconds to warm up. Place warmed tortilla on surface and spread one tbs hummus onto each wrap. 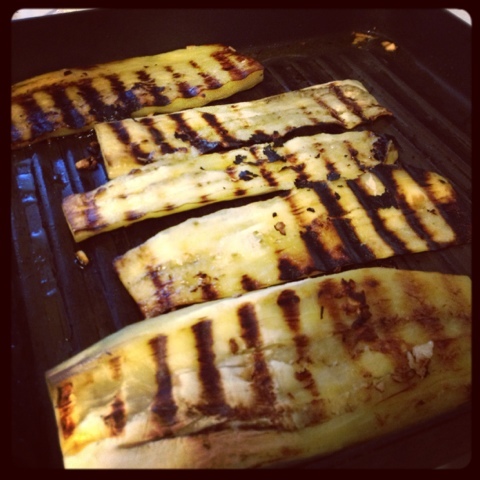 Add 2 slices of grilled eggplant and top with tomato salsa. Serves 4 healthy and delicious wraps!